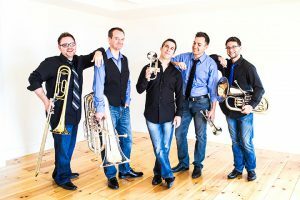 Don't miss the opportunity to listen to the bold new generation of brass entertainment when Dixie State University hosts Presidio Brass as part of its weekly lecture series "Dixie Forum: A Window on the World." At the forum, Presidio Brass will perform sections from their popular touring program, "Sound of the Cinema," and offer a preview of their program for next year. Additionally, the band will ask the audience to participate in a game of "name that tune" and then open the floor for a question- and-answer session. This special presentation of Dixie Forum is set to take place from noon to 12:50 p.m. on Wednesday, Jan. 27, in the Zion Room on the fifth floor of the Holland Centennial Commons on the DSU campus. Admission is free and the public is welcome and encouraged to attend. Additionally, the quintet will perform a full concert as part of Dixie State University's Celebrity Concert Series. The performance is set for 7:30 p.m. on Tuesday, Jan. 26, in the M.K. Cox Performing Arts Center on the DSU campus. Tickets cost $25 and are available at www.dsutix.com. Originally from San Diego, Calif., the group of musicians has captivated audiences everywhere since 2006 and has made a trademark of their unique sound positioned together by a brass quintet, piano and percussion instruments. In addition to performing as a quintet, members of Presidio Brass regularly perform as a part of the Millennia Consort, one of the nation's premiere brass, organ and percussion ensembles. Presidio Brass has released four recordings: "Stolen Moments," a collection of popular classic and jazz music; "Christmas Day," an album featuring well-loved holiday favorites; "Sounds of the Cinema," a selection of pieces from the quintet's tour with the same name; and "Rhapsody in Brass," a highlight of popular American music influenced by classical and jazz idioms. Dixie Forum is a weekly lecture series designed to introduce the St. George community and DSU students, faculty and staff to diverse ideas and personalities while widening their worldviews via a 50-minute presentation. Dixie Forum will be on recess next week, but will return at noon on Tuesday, Feb. 9, in the Dunford Auditorium in the Browning Resource Center with a presentation from Jen Johnson, manager of Labor and Delivery at Dixie Regional Medical Center.